Soon, Vova and Diarmuid were thinking about turning their hobby into a business. While they saw a market saturated in the quality coffee business, they thought that a local company offering affordable prices for a good roast was still missing. After bringing Vova’s brother, Greesha Kagan, and friend Michael Roytman into the fold, the group set out to fill the gap. They bought a twenty-year-old coffee roaster from Craigslist and set up shop in a friend’s basement in Logan Square. The Kagans’ honored their Russian roots by naming the business Sputnik, which was also the name of the first satellite to orbit Earth from Russia. “We like to think of our coffee as a travel companion,” Greesha Kagan explained. 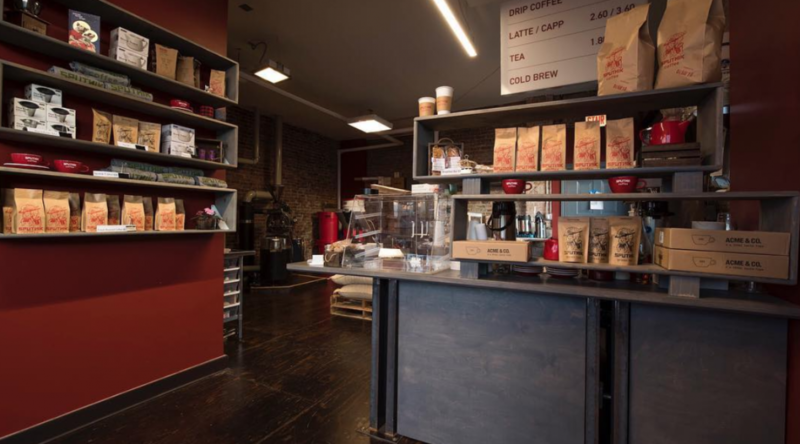 With the demand for their product increasing—from both average coffee consumers as well as restaurants and grocery stores—and the founders’ desire to be more than just a distributor, the coffee savants began looking for a space that they could turn into both a workspace and a café. They opened on 51st Street in March 2018. Now, every Tuesday and Friday, the foursome gets together to roast and package nearly 180 pounds of their single, signature coffee blend. The process is a science: they roast each kind of bean—Colombian, Brazilian and Sumatran—separately and mix them together after. They label each bag with a custom red stamp featuring pups Belka and Strelka, the first animals to return safely from the Soviet-sponsored Sputnik 5 spaceflight. While their vintage roaster holds over 11 pounds of beans, the group sticks to eight pounds of beans per roast to maintain quality. Cheaper than most competitors, patrons can snag a cup of Sputnik’s original coffee blend or imported tea with one refill for $2. A bag of coffee comes to $6 per pound. Nearly everything in the near 700-square-foot café is secondhand, from the roaster to the copper espresso machine to the iron celestial-inspired chandelier, reminiscent of the 1960s Soviet satellite itself. Still, the store is a work in progress. The owners recently opened a patio space off of Hoyne Avenue and commissioned artwork from the students of Back of the Yards College Preparatory High School to animate the solid burgundy walls. Find Sputnik’s original blend in over 25 groceries stores and cafés across Chicago.